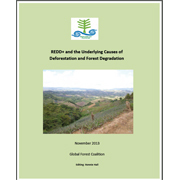 The Global Forest Coalition launched a new report on ‘REDD+ and the Underlying Causes of Deforestation and forest Degradation’ based on five case studies in Brazil, Colombia, India, Uganda and Tanzania elaborated by national organizations in those countries themselves. It was launched at the 19th Conference of the Parties of the Climate Convention in Warsaw. Among its conclusions are, that projects and policies to Reduce the Emissions from Deforestation and forest Degradation and enhance forest carbon stocks (REDD+) fail to address the underlying causes of forest loss and might contribute to further deforestation instead.